You might remember this House Rules Painting Upcycle I did a while back. I was never totally happy with the finish that hand painting the black gave it and I always wished I’d used spray paint. Well, problem solved. I decided earlier this week I wanted to make the kids an alphabet themed piece of wall art. So I upcycled this large canvas (again). All the craft supplies I already had on hand so I didn’t have to buy a single thing for this project! Once I decided on an alphabet themed piece, I started checking my favorite kids sites for inspiration. I scored with the first try! 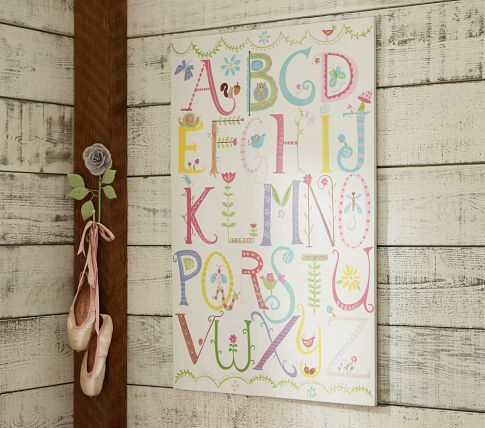 Below is the new Alphabet Wall Plaque from Pottery Barn Kids (which will set you back $129, by the way). I used the basic idea, changing the colors to be reversed to a bright background with white lettering and also making it more gender neutral since I have a boy and a girl. Canvas (mine was 40″x40″). Check clearance sales and goodwill to find a cheap one! I started by determining that for my 40″x40″ canvas, I’d need 10″x10″ squares to make the bright tiled background. 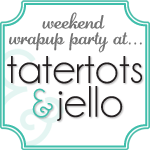 (I cut down 12″x12″ scrapbook squares). I attached them to the canvas with spray adhesive. (It might just be me but this stuff is messy. I always end up with super sticky hands and a sticky floor!). Then I followed the Pottery Barn sign and opted for the same number of letters in each row. This meant I needed my letters to each be about 7.5″x7.5″. I cut them on plain white copy paper using my Silhouette Cameo. Even with the machine doing all the cutting, it was time consuming to re-size each letter…and to decide on a font! I used “Vaguely Repulsive” which you can download here. I layed out the letters as I cut to be sure they fit as planned. Thankfully, they did! When I was done cutting the whole alphabet out, I used the spray adhesive to attach them to the canvas. Then, using patterned scrapbook papers in coordinating colors, I started cutting out all kinds of kid related images: cats, dogs, birds, the moon, the sun, butterflies, an airplane, etc. I bought most of them from the Silhouette store. So, that means I lied about spending $0, I guess. I spent about $15 downloading images to cut. Once I had that done, I attached them to the canvas with the dreaded spray adhesive. I didn’t really make a plan. I just hung it on the wall and kept adding things until I liked how full it was. These pictures were in the beginning stages of adding the little images. Then I simply carefully applied two layers of Mod Podge Matte over the whole canvas. I allowed the first coat to dry overnight before deciding it needed a second. Now, I’m fairly new to the wonders of Mod Podge and it did wrinkle the papers up a bit which concerned me at first, but after it dried I think it just added to the “artsy” look. I did see after the fact that there is a Mod Podge Paper formula that may have been a better option. Any Modge Podge experts out there, feel free to leave suggestions in the comments! Love it! I’m all about PB knock offs. I’d love it if you would share this at Whimsy Wednesdays at http://www.thenymelrosefamily.blogspot.com/2012/03/whimsy-wednesdays-1.html. I’m following via bloglovin. Oh my word! I love this!! Wow! I’m impressed! This is so much better than the PB version! I can’t believe you used only scrapbook paper and copy paper! It looks so vibrant. I thought you used vinyl or something! Thanks for sharing! Dawn! It looks great! I actually like it a lot better than the one at PBKids. You are so talented! !